New England Aquarium officials are investigating after two whales washed up on Boston-area beaches on Friday morning. New England Aquarium officials responded to Revere Beach on Friday morning after a whale washed ashore there. The approximately 35-foot juvenile humpback whale was found before 8 a.m.
"As soon as I got out of my car and looked at it, I was like, 'Wow, like I just can't believe it,'" said Melinda Ball of Chelsea. Officials said it is the same marine animal that was first spotted floating in the waters near Gloucester shores two weeks ago. The whale first washed up on a beach in Cohasset, where it was examined by a team from New England Aquarium. Afterwards, officials decided to tow it out to sea. Now they are working with the National Oceanic and Atmospheric Administration to decide on how to dispose of it. A second whale was also found on Friday near Boston Light on Little Brewster Island in Boston Harbor. The 50-foot adult, female humpback had its tail flukes wedged among the boulders ofa rocky point that was only accessible at low tide. Aquarium biologists had trouble accessing it, but were able to take measurements and tissue samples and document the whale. The whale carcass was quite bloated and appeared to be several days old, the aquarium said. There was no evidence of entanglement or open trauma from a vessel strike. 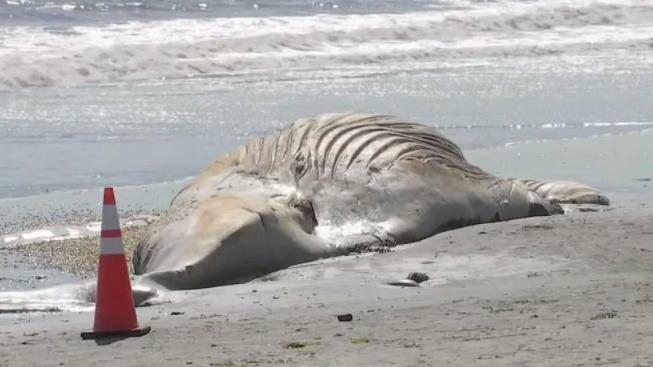 These are just the latest of several deceased whales that have washed ashore recently in Massachusetts. Officials say whale deaths have increased this year, but are unsure why. Since January of 2016, the aquarium said more than 80 humpbacks have died along the East Coast, from the Carolinas to Maine. That's a rate of more than 30 deaths per year, compared to a previous five-year average of 12.